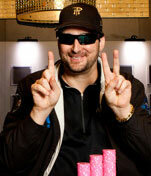 More than 6,300 people played in the main event of the 2007 World Series of Poker (WSOP). While the number is down from last year’s 8,700, no one this year was forced to play in the main event. And those who did play came to Las Vegas of their own accord. And why not? You get to play in the biggest, most prestigious poker tournament on Earth, if only you have the $10,000 buy-in. With the blinds at $200-$400, I picked up A-K, and limped in for $400 — with around $17,000 in chips in front of me (we started with $20,000). The guy right behind me (Player A) made it $800 to go and three players called the $800. When the action came back to me, I reraised it $3,000; and then Player A called me, along with — surprisingly — the player in the small blind. There was now $14,000 in the pot going to the flop, and it comes down K-7-7. The player in the small blind checked, I bet $2,000, Player A called, and the small blind folded his hand. The turn was a J, and I hated it. I gazed into Player A’s eyes, and I did not like what I saw. Still, we both checked the turn. The river was a four, I bet out $3,000 into $18,000, and Player A moved me all-in! I looked down and saw that I only had $8,100 left. What should I do? What would you do? Can Player A possibly be bluffing here? Or more likely, does Player A have pocket kings or pocket jacks? Could he have pocket aces, or the unlikely pocket fours? Is Player A rank amateur holding A-K, just like my A-K, but over-betting his hand? When I stared into Player A’s eyes after the jack hit, I didn’t like what I saw. I really thought that he had K-K, or J-J? After a minute, I decided that the best I can do is split the pot (if Player A is over-playing A-K), and I folded my hand. I can hardly wait to see this hand on the ESPN coverage! Did I make another great lay down, or was I wrong? After losing that pot, my situation worsened. I lost with A-8 to Player A when it came down A-Q-6-10-7 (he claimed that he had trip 10s). Then I picked up pocket queens, and Player B opened for $1,100 in early position. I made it $2,500 to go, and Player B, who only had $3,400 to start the hand, called. I was trying to lure Player B into the pot, so that I could win his whole $3,400 in chips. The flop was K-7-6, Player B bet his last $900, and I called. Player B showed me K-J off suit (I had lured him into the pot all right! ), and I was left with only $1,600 in chips, scratching my head and lamenting my run of bad luck. I felt like it wasn’t fair. I mean to have this bad of a run, on Day 1 of the “Big one,” for three straight years. How is it possible? On the bright side, I am now in the “Poker Hall of Fame,” I did win a bracelet (WSOP tournament) this year and I now have possession of the “Triple Crown.” I have three huge WSOP records: most wins (11), most cashes (63), and most final tables (39). I share the most final tables’ record with T. J. Cloutier. So I guess it’s time to lighten up a bit.